Like all other animals, Gorilla also have species and subspecies. There are two types of Gorillas i.e. only two different Gorilla species exist in the today’s world. 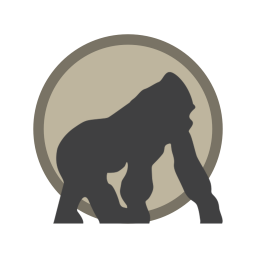 We have gathered complete information about each of the gorilla species and subspecies. You are going to learn about each of them and the differences that make each of the specie distinct from each other. These Gorillas are black to brown-gray in color and start to turn gray with age. They are sexually dimorphic (2 distinct gender forms). Males weigh approximately twice as much as females. As they age, males get a broad silvery-white saddle on their back, from which the term “silverback” for dominant males was derived. Gorillas have large, muscular bodies and adult males are particularly massive in the chest and shoulders. Gorillas’ arms are longer than their legs, a feature that enables them to walk comfortably on all fours. Although gorillas are well-adapted for ground dwelling, they have opposable thumbs and toes that allow them to grasp objects such as tree branches. Gorillas have prominent brown ridges and small ears. Their faces, feet, upper chest and the palms of their hands are hairless. present most of population of western gorillas live in the republic of Congo. Primarily habitats of western gorillas are rain forest, flooded forests, and secondary habitats used are secondary vegetation, clearing and forest edges and riverine forests. The cross river gorillas are also critically endangered species that are found in a small range between Nigeria and Cameroon. Cross River gorillas are the rarest species of great ape in the world. Cross River gorillas are similar in appearance to western lowland gorillas, but have a different shaped skull. They have redder or greyer fur than eastern gorillas. As with all gorillas, Cross River gorillas are sociable and live in groups led by the dominant male (silverback), but their group size tends to be smaller than other subspecies at fewer than six individuals. They are largely herbivorous, eating fruit, shoots and leaves. Cross River gorillas have not been habituated, making study of them even more difficult – they were only filmed in the wild for the first time in 2009. Cross river gorillas live in Nigeria and Cameroon’s highland forests, cross river and some live in lowland forests also. But they tend to live at higher altitudes. Like the Western species of gorilla, the Eastern Lowland Gorillas walk on all fours, however, they use the knuckles on their hands instead of their palms. Eastern Lowland Gorillas are more robust in appearance than the Western Lowland Gorillas, having longer teeth, a stronger jaw and a broader body. Eastern Lowland Gorillas have black coats which in males, like other gorillas, turns silver at the back as the animal matures. Like other gorillas, the eastern lowland gorilla has small ears and broad nostrils. Adult males stand 175 centimetres (69 inches) tall and weigh 165 kilograms (360 pounds). Male Eastern Lowland Gorillas are almost twice as large as females. The Eastern Lowland Gorilla has a well developed social structure and they live and travel in family groups. Each family group usually includes a dominant silverback male gorilla, three unrelated adult female gorillas and four or five young gorillas. The habitat of eastern gorilla is tropical jungles and forests of Rwanda, Uganda and parts of the eastern Congo. Mountain gorillas are similar to western lowland gorillas in appearance but they have different skull shape. They tend to have redder or greyer fur than eastern gorillas. Mountain gorillas are also sociable like other species. They also live in groups led by male gorilla. They are also herbivorous eating fruits, shoots and leaves. The male gorillas are heavier twice than female gorillas. Mountain gorillas found in the mountainous forests of eastern Democratic Republic of Congo, North West Rwanda and southwest Uganda.